With sincerity and hard work of our professionals, we have carved a niche for ourselves in this domain by providing a premium quality gamut of Dome Stickers. Note : Prices may be vary according to the size. This is very hard gum and super fine printing and PU Dom this material very soft. Colourfully printed vinyl stickers, we can develop a wide range of dome stickers in different size specifications. The domed appeal and super-polyurethane resin gives them an attractive appeal. 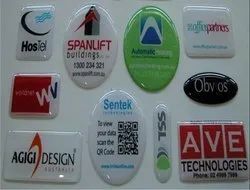 You can use our dome stickers on a variety of products like electronic items, accessories, appliances and others. Stich-able dome stickers are popular in garment, fabric and footwear industry. 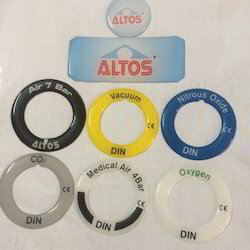 The polyurethane coated dome or bubble stickers are provided with an underneath surrounded fabric for stitching it onto your product. Domes also known as bubble stickers give a high quality three-dimensional (3D) appearance with remarkable visual impact formed by a clear layer of polyurethane. The clear domed shaped resin layer enclosing and protecting the high quality printing provides an exquisite look to the emblem differentiating it from the substitute products. Domes also known as bubble stickers give a high quality three-dimensional 3D appearance with remarkable visual impact formed by a clear layer of polyurethane. The clear domed shaped resin layer enclosing and protecting the high quality printing provides an exquisite look to the emblem differentiating it from the substitute products. Hora Art Centre Pvt. Ltd. These Dome Stickers are made available by us in a variety of colors and patterns and are customized according to the clients requirements. Good quality adhesive is used thus making them a better choice for the buyer.